Hope y'all are doing well and had a great weekend. 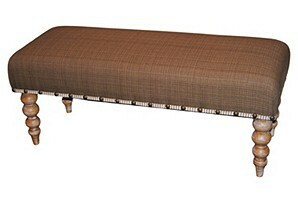 It all started when I wanted to make an upholstered bench like this for our foyer. Seems like a very simple one weekend project for Mr. Fanatic and I to do, but the problem is, he has a long honey do/project list already and I didn't want to add to it right now. I'm a little ~ ok, a lot~ embarrassed to say that I've had these two chairs for like, forever....They've been in my basement for 11 years and I had them in my garage in California for a couple of years before that. I originally found them in my grandmother's basement a couple of years before we moved to North Carolina. I thought if I finished them both the same that I could put them side by side in our foyer and they could suffice instead of a bench. As you can see, they've been sanded a bit, but that's as far as I got....until now. Last Tuesday, I finally made it to Mary Jo's out in Gastonia. I was originally looking for a light linen, but only found this large striped linen. I also found two other fabrics for pillows I'm going to make for the chairs. The price of fabric sure has gone up. Either that, or I have expensive taste. The fabric on the right is flocked anywhere you see black.. I can't wait to get started on the pillows! I'll show you how I transformed these antique chairs some time this week. If you aren't a follower, you can become one by clicking on the Google Friend Connect on my sidebar. Nice Job Pam! you would never know those were the same chairs! Love the fabrics too! Gorgeous! I love how the wood design of the chair back looks like a lady in a gown. Great job Pam! They have to be so special coming from your Grandmother. I love the fabric you used. So glad you saved theses chairs. In black they are modern looking, sleek and beautiful. Great legs too. The chairs look great. I love the new fabric for the pillows. Will be perfect. Wow! Those chairs were in bad shape. You did a great job! You are right! MJ's has gotten kind of spendy. I tend to look for the remnant area. Although that can be pricey too. Great chairs. Ahem. Love the black. Your chairs turned out fantastic! Yea. Fabric at MJs is a bit spendy. But perhaps worth it? LOL. The chairs look beautiful, Pam. I love your choice of fabrics. I could spend hours just wandering fabric stores. Wow and more Wow! The chairs looked so rickety before, but now they look very sturdy and substantial, not to mention PRETTY. Wow for sure! They look great and the fabric choice is superb! I agree fabric has really gone up and that's one reason I don't sew much anymore! Hope the pillows finish the look you want! Great fabrics, especially loving the floral. I love the shape of those chairs and you redid them beautifully! Glad you had a relaxing Thanksgiving, thank you for linking! Oooo, they turned out beautifully. Great fabric choices for pillows. The chairs are now beautiful! Wow! to go from the before to the after! nice job!!! They look great! I love the fabric you chose! This is a true rag to riches transformation! They look great. Beautiful chairs! I would definitely drive an hour for that fabric store! AMAZING!!! I'm your newest follower! Hope you come by Project Queen sometime. The black paint was a really nice choice and your accent fabrics will really make them look elegant. Great refinish. Stop by and see some of my projects when you get a chance!